With Father's day just around the corner, if you are still looking for the perfect gift for daddy dearest, then hopefully this post will give you some ideas. I Coloniali is a luxury Italian brand known for its skincare and fragrance collection. They have a lot of products in the men's range as well. You could choose from the I Coloniali Soothing Aftershave Emulsion with Rhubarb or the I Coloniali Delicate Shaving Cream which is a delicate soap-free shaving cream which softens the skin. This aftershave lotion is ideal for refreshing and toning your skin after shaving. You can purchase the I Coloniali range from Marks & Spencer. Audaca make shaving & skincare products for adventurers. They have a premium range for men featuring face and body wash, scrub, post-shave lotion, shave formula and a moisturiser. All the products are ethically sourced and manufactured in the UK. With key ingredients like - Italian Almond Oil, Walnut Shell, Italian Bergamot Oil, Peruvian Jojoba Seed Oil and Egyptian Bitter Orange Oil among many others, this is a wonderful and natural range especially designed for men. Montagne Jeunesse don't make awesome products just for ladies. They have a men's range as well. 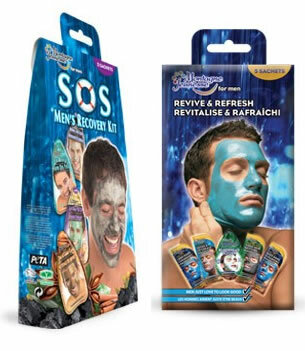 You could choose from the SOS Men's Recovery Kit or the Gorgeous Guys Grooming Set. The Body Shop also has a men’s grooming range that provides a complete skincare solution that is easy to use and designed to work with any skin type. From smart travel-sized solutions for men on the go, to energizing shower gels and antiperspirants, The Body Shop has all your male grooming needs under control. Philips has a range of grooming equipment for men - you could choose from vacuum trimmers, beard trimmers, Nose and Ear trimmers, shaving accessories, hair clippers and lots of other body grooming devices.